Pecan Pie Pringles and Game Of Thrones beer, together at last? The holiday season is fast approaching, which means it’s time for stores to be inundated with both holiday-themed goodies and novelty items meant to be bought and shared with loved ones and friends. For The A.V. Club staff, this can be the best time of the year. Cookies abound, and those of us that like gingerbread-flavored items are in (gingerbread-stuffed) hog heaven. 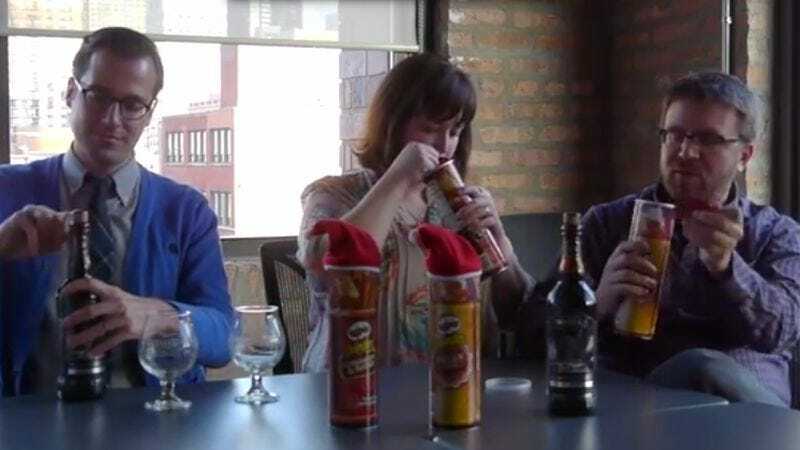 Every year, we try and Taste Test a couple of holiday-ish items making the mass-market rounds. Last year we tried out White Chocolate Peppermint, Pumpkin Pie, and Cinnamon Sugar Pringles. This year, the canned chip manufacturer rolled out yet another flavor—Pecan Pie—so we decided we should mow through that one, too. We contacted ol’ Mr. Pringle, who sent us two cans of said Pecan Pie Pringles, as well as two cans of the recently re-introduced Cinnamon Sugar variety, which we’ve already weighed in on, but enjoyed enough that we didn’t mind eating them again. While the verdict on the former was fairly split, ultimately, Pecan Pie Pringles are an insanely sweet, not-at-all-nutty take on the bakery classic. If that sounds like your thing, then you’ll probably like them. Anonymous responses from individual staff members are below. We also tested out one of those “hey, I’ll buy this for my buddy” items: Ommegang’s second Game Of Thrones beer, Take The Black Stout. While the idea of chips and beer seemed palatable enough at the outset, the dessert chips didn’t really lend themselves to the stout, which was remarkably mild. Though it’s billed as “dark, complex, and bold… like the very lives of the men of the Night’s Watch,” the beer wasn’t really a hit with those on staff that consider themselves stout snobs. Plain old beer nerds, though, liked the relatively dark ale and would verily consider quaffing many barrels of it before journeying over the wall and taking on the White Walkers. Again, anonymous and drunken staff comments are below, but since it was alcohol and it was free, it’s fair to say that we liked it.